Brooks City Base, formerly Brooks Air Force Base, and before that variously Gosport Field and Kelly Field #5, is located slightly to the south-east of downtown San Antonio. At the dawn of American military aviation, Brooks and Kelly were comfortably far out enough in the country that aviators of fixed wing and lighter-than-air flying machines could train without endangering any but themselves. Brooks Field was officially established in 1918 as a training base for the Air Service of the US Army Signal Corps. For some years, Brooks Field was the Army Air Corps primary flight training school, until that mission relocated to Randolph AFB. After that, Brooks became the new home for the Aerial Observation Center. 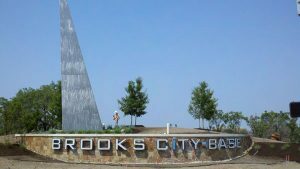 Following World War II, Brooks was the home for several reserve and tactical units, officially becoming an Air Force Base with the establishment of the Air Force as a separate service. In the early 1950s, Brooks became home to the Aerospace Medical Center – to include the School for Aerospace Medicine (SAM), which would deal in research with applicability to flight and space exploration. President John F. Kennedy’s last official act as president was to dedicate the SAM building on November 21, 1963. He was assassinated the following day in Dallas. The mission of Brooks AFB continued to be focused on science and medical research with regard to aviation and space flight, including aerospace medical learning, aircrew health assessment, and such activities as the Air Force’s drug testing lab, and an occupational and environmental health lab. In the mid 1990s, when Brooks was listed as excess for current military needs and slated for closure by the Base Realignment and Realignment Commission, a plan was worked out by city, state, local and military planners to privatize Brooks, essentially to replace military activities with a mix of civic and privately owned scientific, or educational establishments. Brooks is also home to the Museum of Aerospace Medicine, or “Hanger 9” – a World War I-era frame aircraft hanger, the single remaining hanger of 16, built in Brooks’ earliest days, when flight training was accomplished in Curtiss JN-4 “Jennies”. Hanger 9 is listed as a national historic monument. Currently, Brooks City Base is home to the Air Force’s 311Air Base Group. The military mission is expected to close in 2011. Neighborhoods and suburbs adjacent to Brooks City Base include Highland Hills, Stinson Park and Kingsborough Park. Brooks City Base is also a short distance from San Antonio Missions National Historic Park, and Mission San Juan Capistrano.